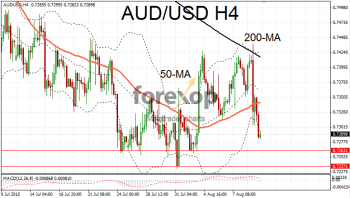 The Australian dollar suffered a strong downward correction today, most considerably against the US dollar. The move came after China announced it would lower the level at which the yuan trades against the greenback. The Chinese yuan trades within a fixed band against the dollar – with the limits tightly controlled by China’s central bank. Today’s devaluation has moved the midpoint down by 1.9% and marks the lowest level in three years. Chinese authorities were under pressure to act as the country’s rapid growth has fallen sharply and inflation remains well below official targets. The devaluation announced today will make the country’s exports more competitive. The flip side of this is that it will do little to stimulate domestic demand, something many economists speculate is necessary to rebalance the economy. The move will also make dollar denominated imports such as oil and materials more expensive. 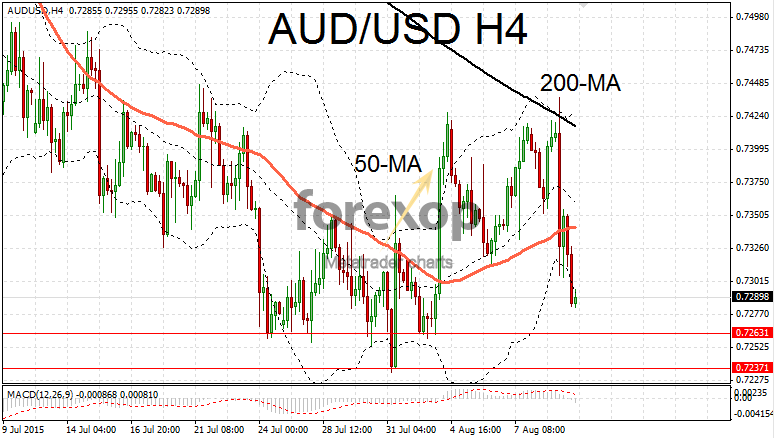 AUD/USD fell 2% on the news taking the level down to 0.7290. The move puts AUD/USD back within striking distance of six year lows and reverses most of the gains won over the past week. Support is expected around .7263 and .7237. Further downward corrections cannot be excluded however as many traders will be speculating that the Chinese central bank could surprise again with another devaluation. AUD/JPY fell close to 2% taking the rate back down to 91.21 and below the 50-day moving average. Also hit in the crossfire, NZD/USD suffered another slide down to 0.6529. The battered kiwi remains close to six-year lows against the greenback. Metals and crude oil also suffered a sharp downward correction as markets readjusted to the new level of the yuan. Brent crude fell US$1.3 taking the front contract down to US$48 per barrel. Copper prices also fell. The Canadian dollar reversed yesterday’s gains as USD/CAD pushed back up towards 1.3128. As well as the commodities story the “loonie” was hit by some soft data from the country’s housing sector. New housing starts missed forecasts after dropping a seasonally adjusted 9,000 units on the previous year.